Poet, artist, philosopher and general interesting fellow, Edward Monkton is a loveable character and brand that has taken the world by storm! From humble beginnings on a few black and white greetings cards, Edward Monkton designs can now be found on everything from mugs and keyrings to phone charms, cuddly toys and even underwear! 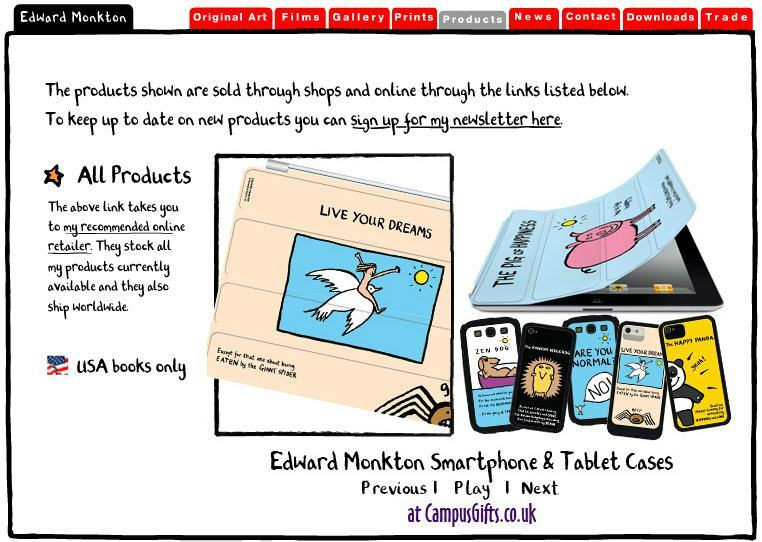 Edward Monkton's website recommends CampusGifts! The relationship between CampusGifts and Edward Monkton was established almost ten years ago, and we have been working closely together ever since. We are proud to say that we are the Recommended Online Retailer for all of Edward Monkton's extensive range of product, and are linked directly from the Monkton website. One of the many things we love about the Monkton range is its fun and quirky persona. While you might not choose to describe us as "quirky" (though some might beg to differ! ), at Campus we like to acknowledge the importance of having fun and being playful. Not so that it stands in the way of hard work (well, most of the time), but because it's the quirky and amusing little things in life that can really make a difference and bring a smile to our faces. And Edward Monkton fits the bill perfectly! We try to work as closely with all our suppliers and brand owners as possible, and Edward Monkton is no exception. We meet frequently with creator Giles Andreae to ensure we continue to represent Monkton in the best light possible. In fact, we've stocked Edward Monkton goodies from our very first day of trading. That's a nine year partnership that is still going from strength to strength as we continue to offer the best range and the best service for Monkton products anywhere on the web. If you have any queries regarding our brilliant Edward Monkton gift range, our customer service team are on hand to assist you. Our phones are staffed from 08:30 to 17:30 from Monday to Saturday, and we guarantee you will talk to real people and not be put on hold. Emails are answered within four hours (allowing for evenings and Sundays), meaning we really do offer you the best service. Email customerservice@campusgifts.co.uk or call 01494 79042 if you have any enquiries, Monkton-related or otherwise.